A visit to Robin Hill alone will leave you feeling rested and rejuvenated. 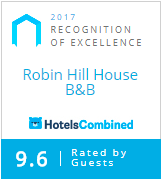 If you are looking for the perfect place to stay in Cobh then look no further than Robin Hill House. Set in the beautiful surroundings of a 19th century former rectory overlooking Cork harbour, a true oasis of peace and calm where time seems to standstill. We offer home from home quality accommodation in Cobh in a peaceful and beautiful setting. Robin Hill has received glowing accolades for their holistic and massage treatments. Or if you fancy a bite to eat we serve snacks, lunch, morning coffee, sweet treats and our signature Afternoon tea in our truly authentic Victorian Tea Rooms. We are pet friendly (pre booking essential). Robin Hill is Cobh's premier holiday destination as it lies in between The Wild Atlantic Way and Ireland's Ancient East.